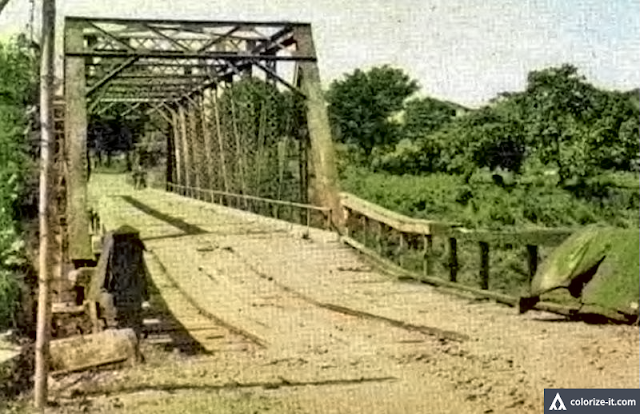 The picture above is of the Palico Bridge in Nasugbu and taken from the public domain book “The Angels: a History of the 11th Airborne Division, 1943-1946.” The book was written by Major Edward M. Flanagan Jr. and published in 1948. The retreating Japanese were caught entirely by surprise trying to blow up the bridge; and the fact that they failed to do so meant that the United States Army could advance quicker up the Tagaytay Ridge. The picture above was enhanced using graphic software and then colorized courtesy of Algorithmia.